WooCommerce is capable of selling products, but with the Product Add-ons Extension, you can Create an Invoice Payment Page with WooCommerce. IMPORTANT: You must have WooCommerce installed and configured to sell products. Buy and install the WooCommerce extension Product Add-Ons. How to install WordPress plugins. Also, see How to create a donations page with WooCommerce. Enter a title of Invoice Payment. Product Categories: If you don’t want to see related products below the Invoice Payment product, don’t add the invoice product to a category. Uncheck Enable Reviews. Most likely, you don’t want reviews on an invoice payment page. 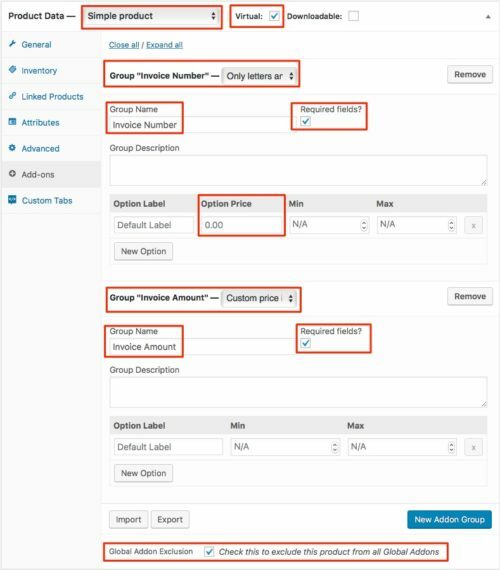 Create an Invoice Number field: From the Group list, select Only letters and numbers. 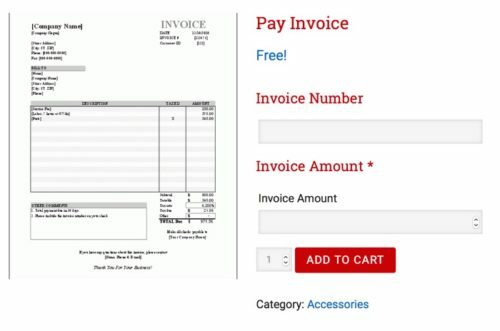 Click Set Featured image to add a product image for the Invoice product. If you don’t specify a featured image, WooCommerce will use the default product image. Click Publish and review the invoice product. Notice that the Invoice product shows “Free!” on the single product page and on the category page. That’s it. You now have an invoice payment page. Make sure you create a test invoice payment to make sure everything works. Amazing tutorial, this is exactly what I have been looking for!